The main difference between pity and sympathy is that pity is feeling sorry for another person’s misery while sympathy understands that person’s circumstances, e.g., their hardships and also feeling sorry for it. 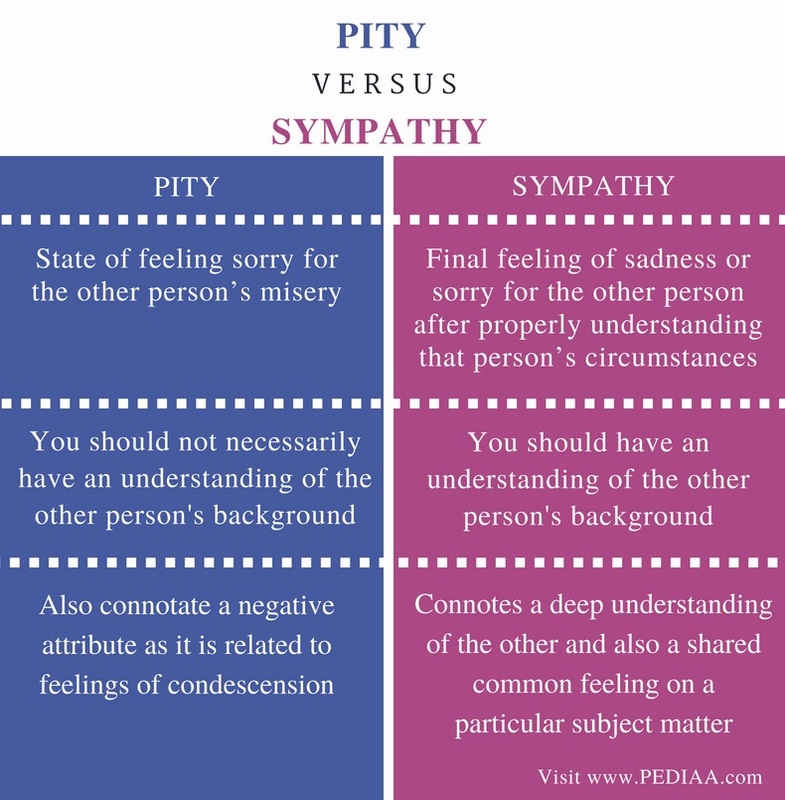 Furthermore, unlike sympathy, pity can also connotate a negative attribute as it is related to feelings of condescension. Pity and Sympathy are two qualities that describe how someone feels towards another person. They are essential aspects of showing kindness and understanding fellow human beings. Even though these sentiments have converging aspects, they diverge in their occurrence. Pity is basically feeling sorry and sad after seeing someone’s misery. Moreover, to feel pity one doesn’t have to have a proper understanding of the other person’s life status, unlike sympathy. Moreover, it denotes feelings of sorrow for others, especially when they are in trouble of going through distress or pain. Moreover, pity can have a slightly negative connotation as it can also refer to feelings of condescension or disdain. 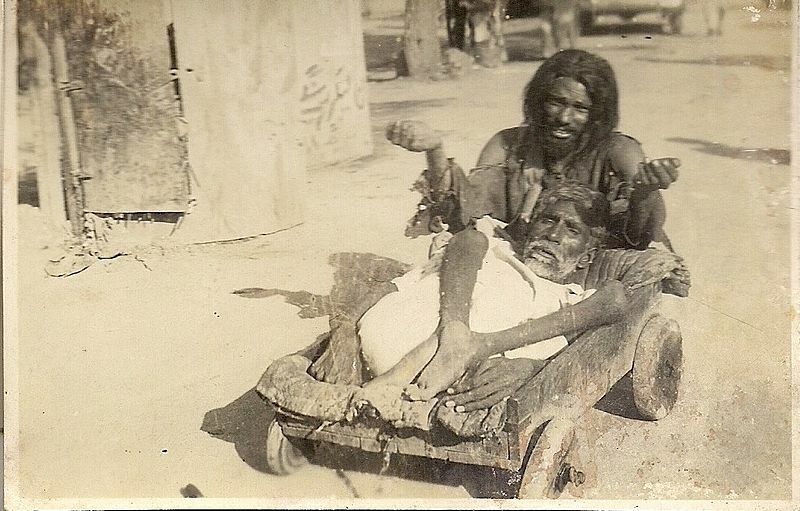 For example, when you see a beggar on the streets, you feel pity about his low-life condition and start feeling sorry for him. Here, the pity you feel may connote the fact that you feel superior to him. Unlike pity, sympathy happens with understanding other person’s life status. Though most people think sympathy is related only with feeling sorry for the other person, it also denotes an understanding between people; common feeling. Therefore, by feeling sympathy, you also mean that you share that person’s bad circumstances of sorrows and misfortune. Therefore, unlike pity, sympathy does not connote any negative meaning followed by the feelings of condescension where the subject of sympathy is looked as inferior to you. Nevertheless, this feeling of sympathy is in most situations linked with melancholy and unhappiness. For example, when a relative of yours passes away, you will offer your sympathies mutually among yourselves, after feeling the sorrow of losing someone dear. Pity is the state of feeling sorry for the other person’s misery. Sympathy is the final feeling of sadness or sorry for the other person after properly understanding that person’s circumstances. Pity can also connotate a negative attribute as it is related to feelings of condescension. However, sympathy connotes a deep understanding of the other and also a shared common feeling on a particular subject matter. 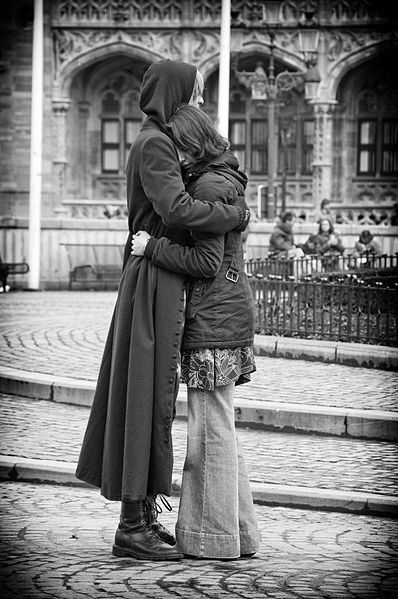 To feel pity, you should not necessarily have an understanding of the other person’s background. You can feel pity just by seeing that person’s misery. On the other hand, to feel sympathy, one usually have a proper understanding of the other person’s circumstances. Therefore it is also a shared feeling among all. Sympathy and pity are two human emotions that are feelings of sorrow about someone’s misery. Even though feeling pity is directly related to feeling sorry for the other person’s misery, sympathy derives from a deeper understanding of the other person’s circumstances. This is the main difference between pity and sympathy.